This mod allows the player to choose their teammate, Mira or Hanharr on the critical moment in the Arena. * Drop "305han2.dlg" in the override folder. Simply remove it to uninstall. 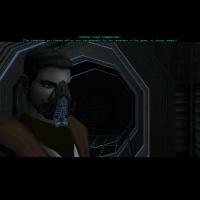 This mod may not be modified or distributed without the explicit permission of the author. Find me at the deadlystream forums (http://www.deadlystream.com/forum). * The TSLRCM Staff for making TSLRCM and getting me into modding for TSL. Although nothing has been done here but extracting . THIS MODIFICATION IS PROVIDED AS-IS AND IS NOT SUPPORTED BY LUCASARTS, OBSIDIAN ENTERTAINMENT, THE TSLRCM CREW OR ANY LICENSERS/SPONSORS OF THE MENTIONED COMPANIES. USE OF THIS FILE IS AT YOUR OWN RISK AND THE ABOVE MENTIONED COMPANIES OR THE AUTHOR IS NOT RESPONSIBLE FOR ANY DAMAGE CAUSED TO YOUR COMPUTER FOR THE USAGE OF THIS MOD.